Nigerian Fried Plantains and eggs is one easy meal you’ll love if you are short of time, but want a palatable meal in less than 15 minutes. 1. 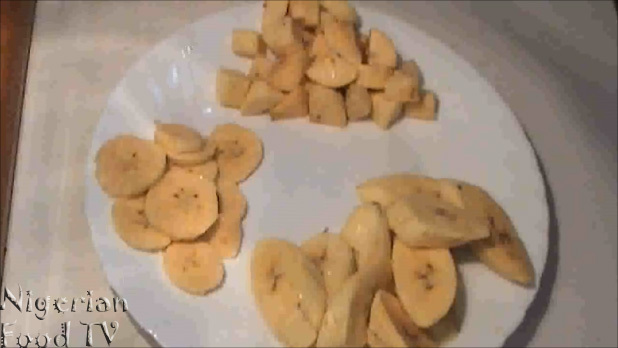 Cut off the top and bottom of the plantain. Make a shallow cut on the side and peel of the skin from that point. 2.Next, cut the plantains to any shape of choice.You can sprinkle some salt on the plantain if you like salted plantains. 3. Heat up the oil and fry the plantains until brown. 4. Now chop the onions, tomato and pepper(to taste). 5. Break the eggs,add salt to taste and whisk until double in size. choice(I like using a little stock cube). 7.Next , add the whisked eggs and leave to cook for some seconds. Then turn it over , so that the other side will cook as well. 8. Now the eggs are ready to be served with the fried plantains. ENJOY!